Troy Deeney has published several examples of the racist abuse he received on Instagram in the wake of Watford’s 3-2 win over Wolves in the FA Cup semi-final on Sunday. Deeney then announced that he’d be disabling comments on all of his Instagram posts in a bid to protect young followers and to starve the morons of their dim-witted oxygen. Due to events from the last 24 hours I will be taking comments off my posts. To me, this isn’t a game. When you racially abuse my family or myself I have to take measures to prevent young people seeing these comments and thinking that it’s acceptable, and having to expose people I care about to these small-minded people. The idiotic, bigoted few ruining it for the many. Same old, same old. 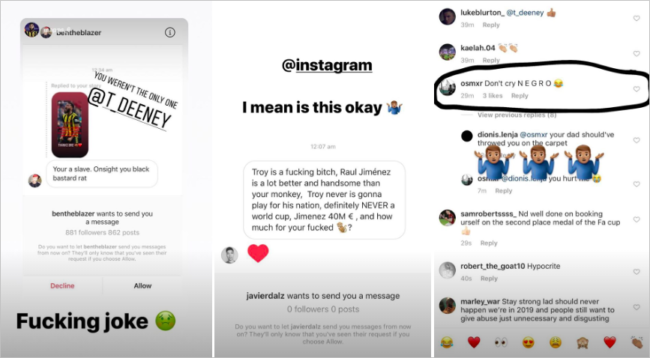 It also turns out that Deeney wasn’t the only Watford player subject to racist haranguing either, with BBC Sport reporting that Adrian Mariappa and Christian Kabasele also received similar messages. Perhaps a good start would be for all of these social media platforms to start taking far sterner action to prevent or at least deter this kind of thing. This needs commenting on but I can’t put into words how strange these people are that spend their time trying to upset other people, unfortunately social media gives these weirdos a platform to do just that, I’m just surprised they have the typing skills without opposable thumbs.